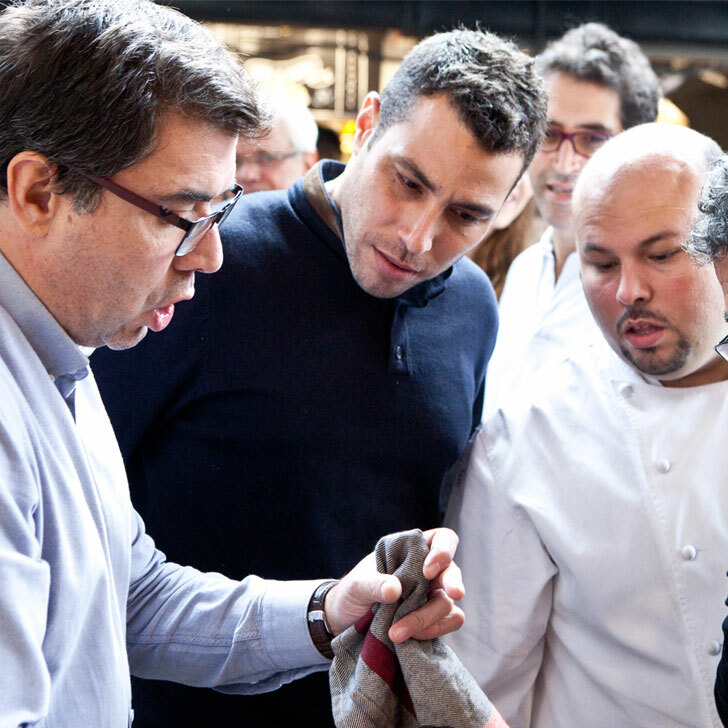 The Eat Boqueria experience is divided into three stages and lasts about an hour and a half, depending on how long we spend enjoying every moment. In the first part, called History, as you wander along the attractive walkways of the market, Carlos will tell you all about how La Boqueria was born, where its name comes from and how it has been preserved throughout different periods and key dates. La Boqueria is like a small town though, which has its pros and cons. 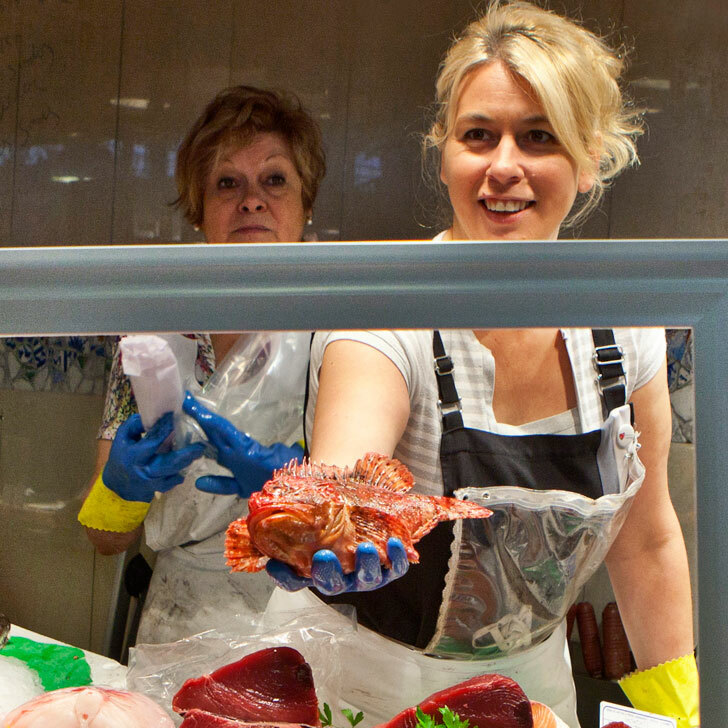 If you want to feel welcome and get a taste of the real Boqueria, you won’t need a tourist guide, you’ll need a sponsor, someone who belongs there and knows the right people, so you can access the knowledge and stories behind each stall. This will help you not only choose the best product, but taste it, knowing and appreciating every detail. That’s why Carlos and his team are your best companion. After more than 8 years rushing around the walkways of La Boqueria, he knows every name, every product and every hidden gem, which he has handpicked for you to live the true Boqueria experience and taste Barcelona with all of its spices. Now is the time to put our palates to work with all the knowledge we have acquired and enjoy the taste of four of the main favourite Spanish products: ham, cheese, olives and wine. In the tasting experience you will be able to try the best products from every stall. 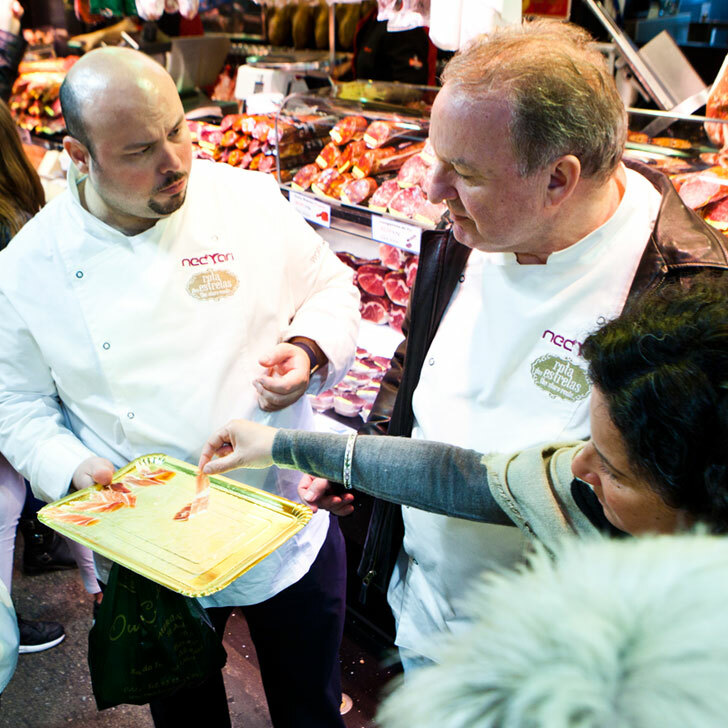 In addition to savouring the most amazing and authentic flavours, you will learn to identify the best products and even the best way to cut ham! That way, you will obtain a lot of privileged and VIP information. 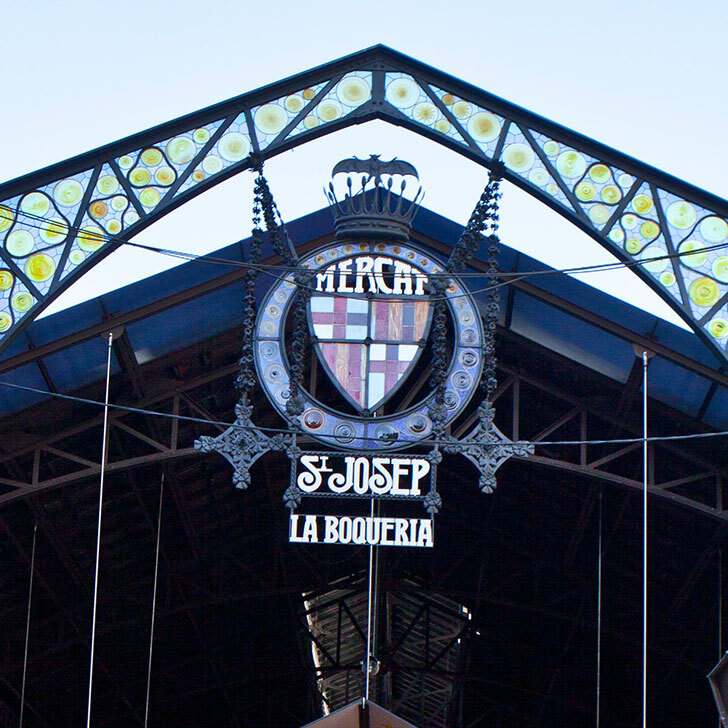 Read client’s opinions about EAT Boqueria. Private tour of the Boqueria Market was excellent and a one of the highlights of our trip to Barcelona. My husband and I had heard about the Boqueria Market from friends and travel advisors and were excited to include a private tour of the market in our plans. We scheduled through the market’s web-site and quickly received a reply from Carles regarding our tour. The tour was a fabulous combination of sights, tastes, and conversation – a true experience. With Carles as guide we were able to engage in a fun conversation with the staff in the food stalls we visited – in spite of our limited Spanish – while enjoying a few samples along the way. We also enjoyed getting a peek into the private areas tourist cannot visit such as the beef aging locker. Our visit was concluded with an excellent sampling of wine and local tapas while enjoying a discussion with the owner of the bar and Carlos. It was well worth the time and was one of the highlights of our trip – not only for the opportunity to tour the market but also for the warm hospitality that Carlos provided. It was very interesting for us to hear the story of the Boqueria market, while we enjoyed some amazing food. The tour guide and traders are friends, and we get the best service from them. © 2017 Viva la Palabra, S.L.